If you’re struggling through Exchange Server database corruption issues and stuck in the middle of everything and cannot find out a way to fix it without compromising with the information and data which still exists on the database. The most imperative thing at first is to identify the reason behind and learn the exact way you can use to get over the problem because in the worst-case scenarios, you can mess the database file and will lose all the data, which adversely would create consequences for sure. In this article, we’ll explain to you how to find out the cause behind the corruption and how effectively you can fix the issue without putting the database file in any more danger. Knowing about the right reason and the right type of corruption, tackling the problem would become effective. Physical and Logical Corruptions, both are the primary type of corruptions which may encounter with the Microsoft Exchange Server. Let’s dive in a little deep about of the types. The occurrence of Logical corruption can happen at discrete levels, and it is quite complex to find out the specific level on which it took place. At the database level, it is possible that you may have invalid index entries or cross-object chain linkage due to database engine failure. Also, you may encounter the chances of database corruption in the database file header or some specific incorrect access control levels. The cases of Physical corruption are utterly considered critical. Though in the matter of Physical corruption, it requires the involvement of data recovery experts to examine the corrupt or damaged Exchange database, and specifically Sever/Database repair & recovery specialists. We’ll talk about who you can call for the repair & recovery a bit later in this article below. So, what are your options in cases like above? Well, like we discussed if it is the scene of Physical corruption the touch of a repair & recovery specialist becomes necessary. 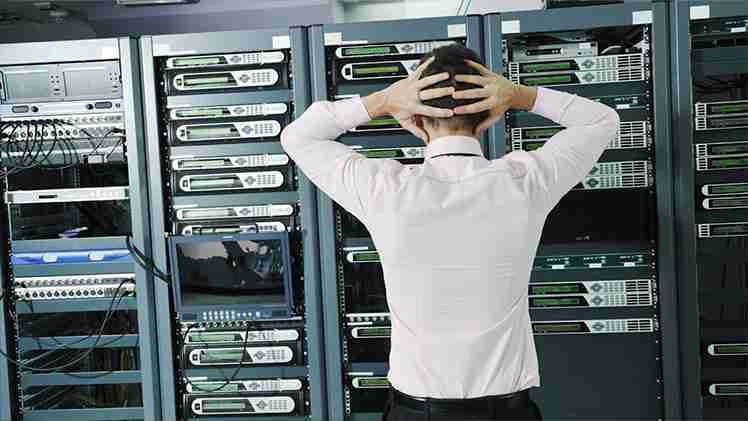 But what can you do if the Exchange Server database is suffering through Logical corruption? There could be tons of reasons for the existence of Logical corruption, as it is quite not straight to predict the exact reason behind because every reason for corruption is very specific, though Logical corruption can take place any time. Application malfunction, Unexpected database shutdown, Virus & Malware attacks, and other possible things are the reason abaft the Logical corruption. At some extent, it is challenging to source out the problem which later turns out as frustration & the task becomes time taking for the absolute prevention. A database is a document which consists of Tables and record, though in cases of corruption to rectify the file integrity and verify the file structure, Eseutil utility comes handy. It allows overcoming integrity issues that are related to the information store and the directory. Isinteg is an abbreviation for Information Store Integrity Checker. The workability of this built-in utility is comprehensive. It scans the Exchange server database to amend those errors causing severe problems while logging in of the user to the Exchange Server Database. The utility runs checks over the public and private information store databases. Also, the utility runs checks for tasks like data acquiring, file opening and removing specific emails, etc. Isinteg utility turns out to be a savior in various horrible recovery situations, for example, System Crash and creates log information in the event viewer, logging about the whole recovery process in detail, though with the help of logs you can track the reason and be ready in advance from future Logical corruption or damage issues. Can you take advance prevention measures to avoid the occurrence of Software/Lite corruption? Make sure to mark your system safe from a variety of Malware & Virus attacks and confirm there is no modification in the configuration. For business enterprises, Corporate & Non-corporate personnel, it is recommended to have the latest service pack of Microsoft Exchange Server installed on your system. These current service pack builds bring all the bug fixes and performance enhancements. 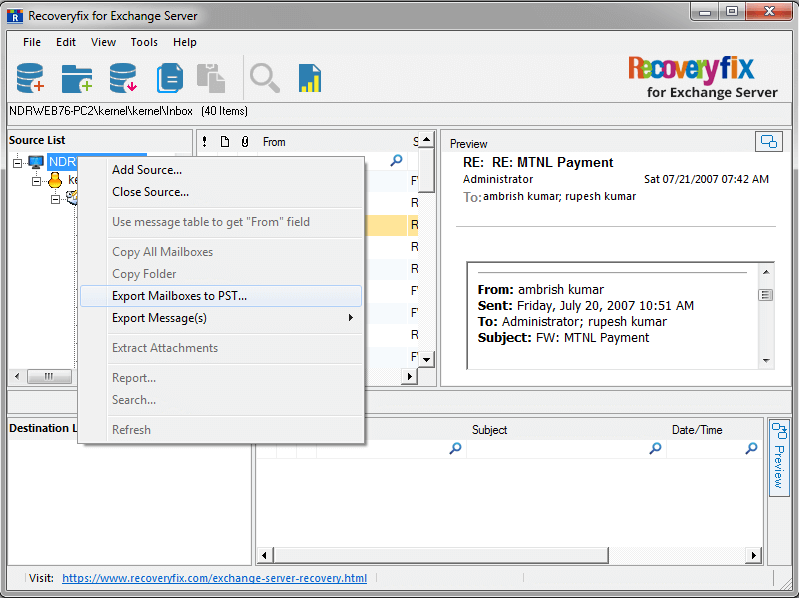 Also, the service pack helps in sorting trivial issues faced while using MS Exchange Server. What to do when Eseutil & ISinteg didn’t work? In the situation when you’ve tried both the Eseutil & Isinteg utilities as per the respective call, but none of it worked, and this is when any furthermore interaction with the corrupt exchange database would lead to disastrous aftermath. Opting for a professional tool of the same genre would be the best option and is the best guidance. 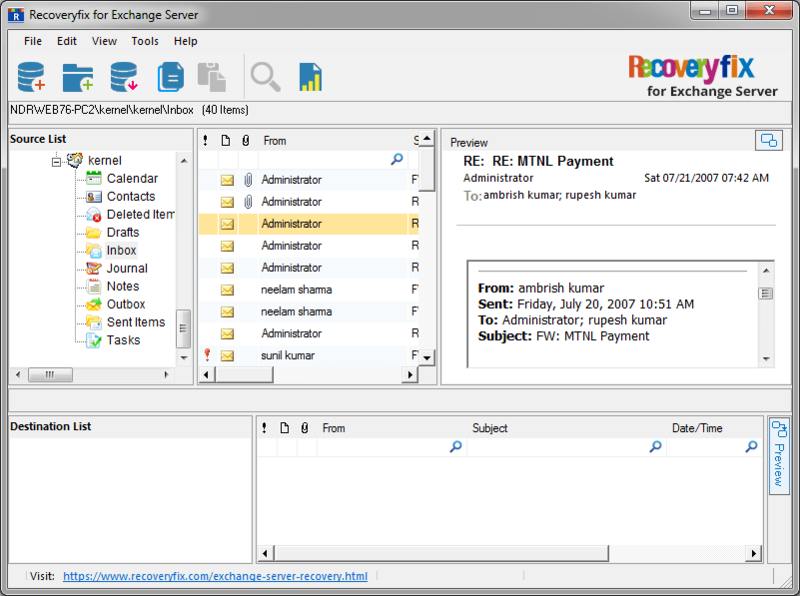 Recoveryfix for Exchange Server Recovery is an advanced & professional software which can save you from the corruption fiasco. 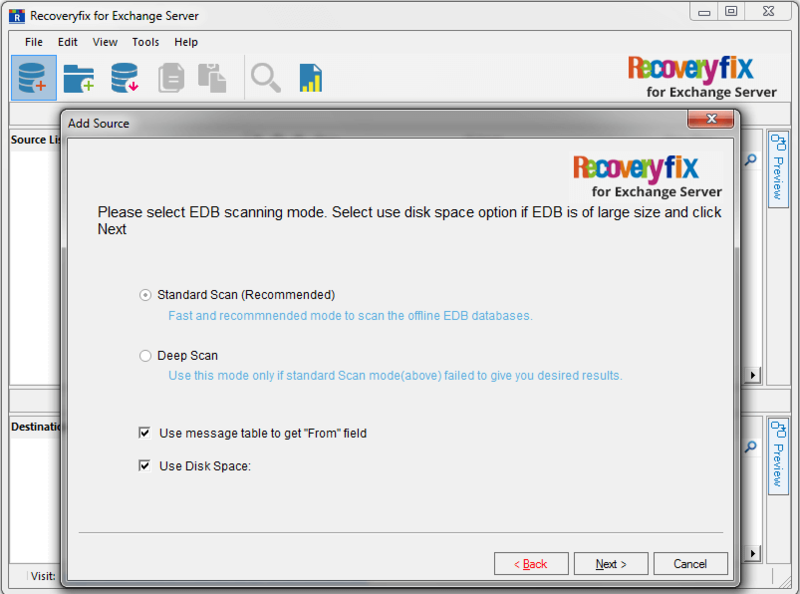 The tool provides a diversity of features to convert edb file to pst, backup, export, etc. And you do not worry if you’re still using an older version of Exchange Server because the tool offers wide support for different Exchange Server release like Exchange Server 2000, 2003, 2010, 2013, 2016 & 2019, the latest version. 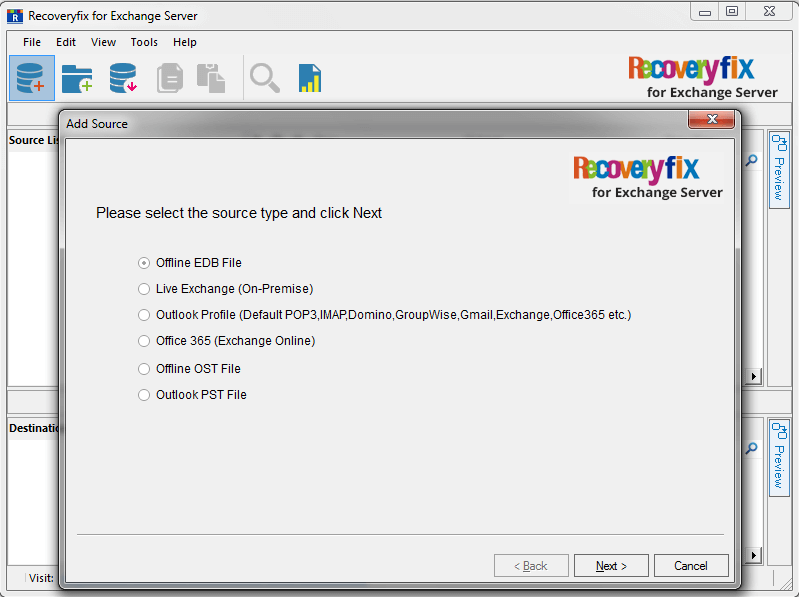 Download and install RecoveryFix for Exchange Server Recovery on your system. On launching the tool, the welcome window will ask to select a source. Select Offline EDB as a source and click Next. Click the Browse button and select the specific EDB file. Note: If you don’t know the location of the EDB file, you can find all the EDB files in your system using the Search option. 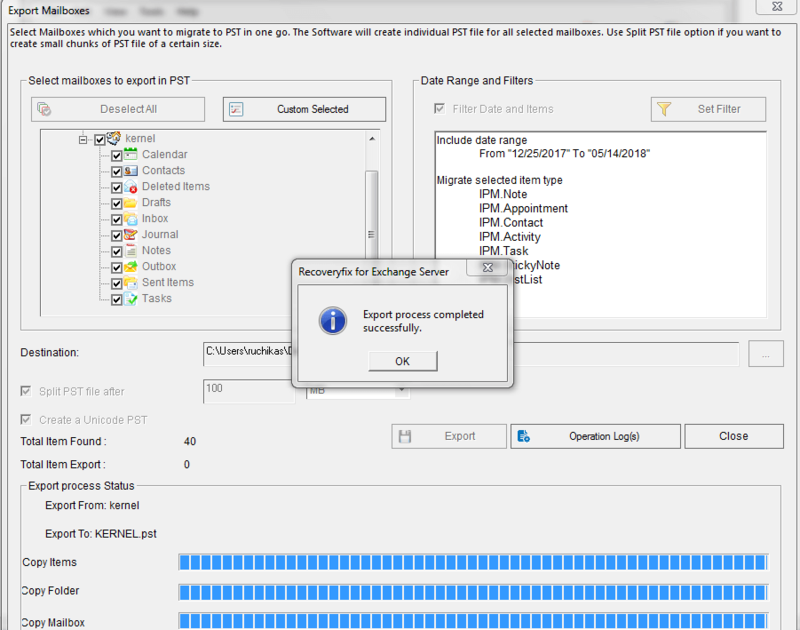 Select the specific scanning method for the corrupt EDB file. There are two scanning methods available with the tool, i.e., Standard and Deep Scan. After the scanning process is complete, the EDB file will be added to the tool. You can view all its folders in the left pane of the tool. Note: You can preview the content of every EDB folder by clicking the specific folder. 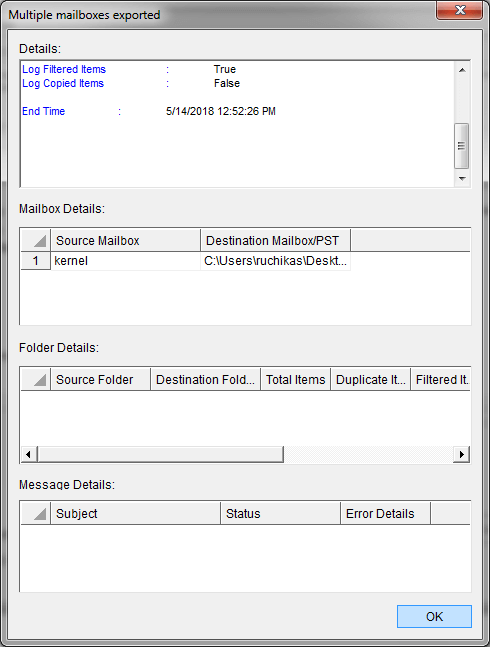 Now, to export EDB file items to PST, right-click on the EDB root directory and select Export Mailboxes to PST. On clicking Export Mailboxes to PST, the following wizard will appear on the screen. Here, you can choose the specific folders that you want to Export, apply specific filters to the mailboxes, split PST file according to your requirements, etc. 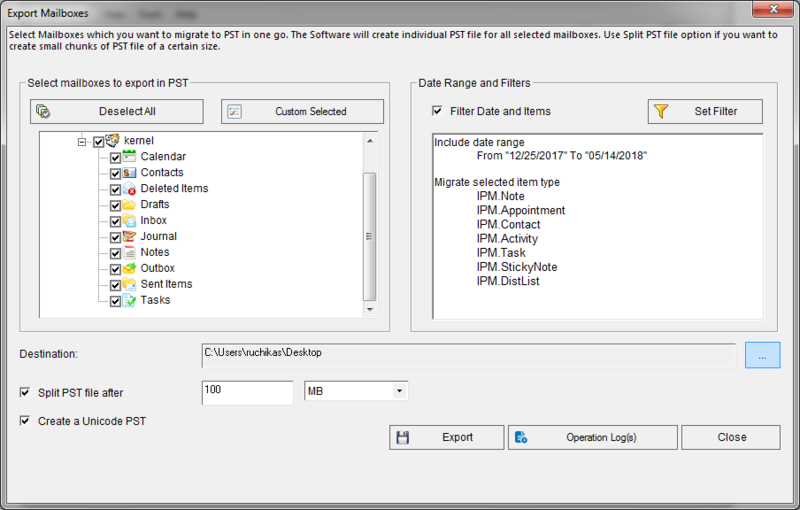 Then select a location to save the PST file and click Export. The export process will take some time depending upon the size of mailboxes. Once it is complete, the following notification will appear on the screen: Click OK. The detailed summary of the export process will be displayed in a wizard. Click OK to end the process. Usually, the built-in utilities for recovery work like a charm when the level of corruption is not intense. But in unfavorable situations using a professional tool is the choice that remains.